Astragalus is the chief energy tonic of traditional Asian medicine. A graceful, flowing plant with long stems bearing paired, pointed leaves and purple flowers. The astragalus is harvested for its roots that are white when dug out of the ground but become yellowish as they are dried. Common names: Milk vetch, Huang qi, locoweed, goat's thorn, huang qi, ogi, and hwanggi. 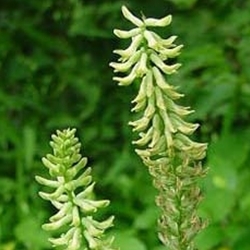 Astragalus (Astragalus membranaceus) has been used in China for hundreds of years as "Huang qi". The name “huang” refers to the yellow color inside the root and the character for “qi” to its traditional classification as a “superior” tonic herb. * There are more than 2,000 varieties of astragalus in the world. One type is native to Northern China, and it has been widely tested. In traditional Chinese medicine, the root has been used for the support of what is historically referred to as energies of the 'spleen,' or the energy body responsible for 'grounding' the energies of the body in the environment. Diseases treated with astragalus can result from poor nutrition or digestive problems. Modern research shows that simple preparations of astragalus as a whole herb stimulate the immune system in several ways*. The plant is allowed to mature for 4 to 7 years and the root is harvested in early spring. Huang qi contains many constituents, including amino acids, polysaccharides, triterpene glycosides, flavonoids, isoflavones, saponins and trace minerals. Around 4700 years ago, the Chinese Emperor Shen Nung is said to have eaten 365 medicinal plants in his lifetime. Huang qi was one of the plants he recorded for use. The notes he left on their effects provide important clues valued by researchers to this day. His court preserved his knowledge and findings, enabling hundreds of generations of Chinese doctors to learn and expand upon what he discovered through personal research. Directions: Take 9–15 grams (3 to 5 tablespoons) of the whole herb per day as a decoction made by boiling the ground, dried root in water for a few minutes and allowing the mixture to simmer.